So this is a post - that I should have written and posted before I went on holiday in August - but it was hectic what with work and getting packed and getting places so I never got the chance. Things have finally settled down since coming back nearly a month ago so I've managed to write up the post and edit the video I filmed before going on holiday (which I'll post at the bottom). So the weekend before Dave and myself went on holiday we spent 'holiday' shopping - which involved a trip to Primark in Milton Keynes and a raiding of the shelves in Superdrug. I don't know why we left it so late to do everything - I think it was because I had to wait until I was paid and it was the only weekend leading up to the holiday that we were both free. So I have already done my 'Primark Summer Holiday Haul' which you can find HERE. That was for all the clothes I bought for the holiday. Dave didn't buy much (compared to me) so I only show cased my stuff. 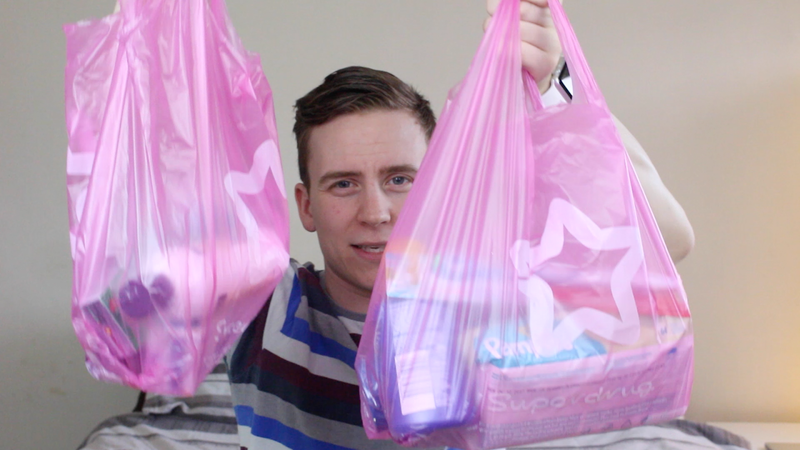 This post (and video) focuses on the things we bought in Superdrug - which were things we wanted to be able to leave behind or throw away once the holiday was finished with. It excludes things we already had - like deodorant, shower gel etc. 1. Colgate Toothbrushes - Soft/Medium - Dave and myself both have electric toothbrushes and as you probably are aware - they're not cheap. Plus we didn't want all the hassle of taking the cables, adapters, the toothbrush itself and any parts. So we opted for a couple of these toothbrushes - which were on sale at £1.99 each - so we used them and then on the last morning when we were packing we threw them away. 2. Sensodyne Repair & Protect Toothpaste - Again because of all the problems with my teeth - I have expensive toothpastes and use about 3 different ones (don't ask - my dentist told me too) so we bought one to take with us and we left this for the next people going in - just incase they ran out or needed it. 3. Superdrug Dental Floss Harps - So apparently cleaning your teeth with a toothbrush no longer is enough and so I floss every time I brush to get the food and whatever else out from between my teeth and these things are amazing - you get a U-shape with floss on the edge and then its a toothpick too. So I keep a couple in my wallet for when I'm out and the rest are in a nice little jar by the sink. 4. Nurofen - Ibuprofen - When I went on holiday I had toothache and the dentist recommended ibuprofen so we took a couple of packs. Plus they're also good for hangovers and headaches. 5. Aussie Shampoo & Conditioner - Miracle Shine - I love this make of shampoo - I found out about it from another blogger ages ago and haven't used anything but this range since. It makes my hair so soft and shiny. We bought a bottle of each for the holiday and it lasted the entire time so we threw the empty bottles away before we came back. 6. Nivea Sunscreen SPF 30 (cream) and SPF 50 (spray) - The one thing I hate about sunscreen is that its so damn expensive! As I'm Scottish I burn quite easily so we bought a SPF 50 spray cream for me mostly - Dave did use it somedays when it was really hot. For Dave we got the SPF 30 cream which he used most days. It was buy one, get one half price so we saved a little on these two. 7. Pampers Baby Wipes - I love baby wipes - I think they're amazing! I tell people I buy them and they always look oddly at me as I don't have a baby! But they are great for sticky fingers, sticky faces and lips. Sometimes I even use them on dirty surfaces if I don't have a washcloth to hand. You get 64 for 99p and the pack is resealable so they don't dry out. They're also great for festivals - if you can't be bothered waiting on the showers. That was everything I bought - we also took things like hair gel, hair wax, face creams, face masks, deodorant, hairspray, combs, aftershave and lots of other things that I can't think about. Let me know in the comments if you've bought/used any of this before.